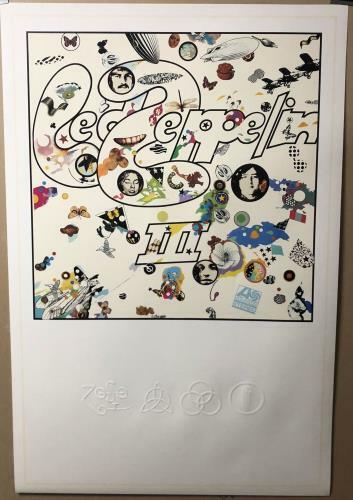 LED ZEPPELIN Led Zeppelin III (VERY RARE 2014 UK limited edition 36" x 24" litho print specially commissioned by Jimmy Page for the 2014 180-gram remastered issue of their 1970 third studio album. The print is one of a series produced for each of the first four album reissues. Featuring a 20�" x 20�" image of the iconic album artwork designed by Zacron, above an embossed 'four symbols logo', with a thin cream line border and white background. Printed on high quality textured card and manufactured in extremely limited quantities, this item remains in fabulous mint condition and would looked amazing framed).